This location provides only GPS installation services. It does not issue loans. 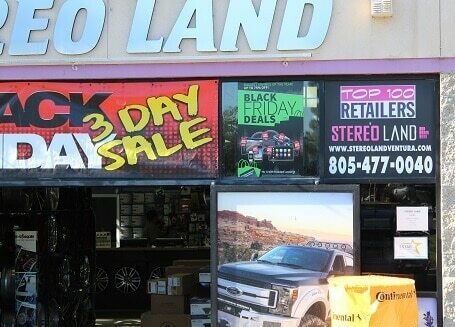 Stereo Land provides GPS installation and removal services for 5 Star Car Title Loans customers. The store is located at 4505 Telephone Rd. Suite G, near the intersection with Transport St. 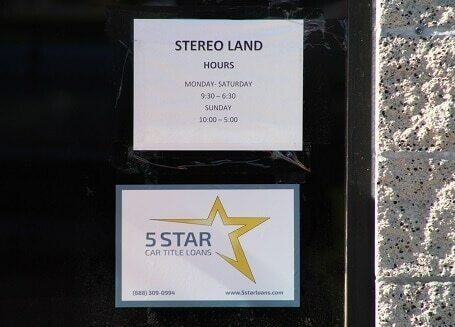 If you live in Ventura and in need of installation or removal of GPS device, stop by Stereo Land that works with 5 Star Car Title Loans in Ventura. 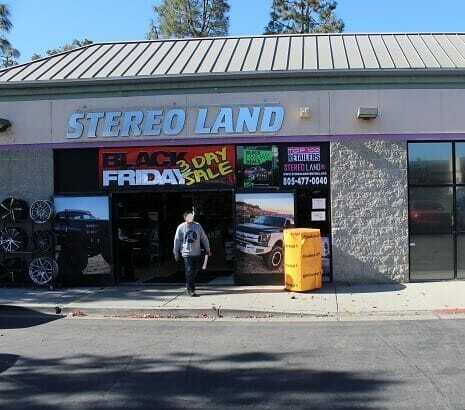 Stereo Land provides our clients with unmatched customer service. 5 Star Car Title Loans does not issue loans at this location. Few people know that in the early 1880s there was a thriving Chinese community in Ventura. The area called China Alley is where the highest concentration of Chinese activities took place. Today in the city’s downtown business district there is a China Alley Historic area that is an official point of interest to visitors and residents alike. Another area of interest is the Ventura Pier. When it was constructed in 1872, costing a grand total of $45,000, it was California’s longest wooden pier. To everyone’s dismay, a ship came along in 1914 and barged into it, cutting it in half. After being rebuilt in 1917 (with steel reinforcement) it was used for 64 years. In 1995 it was a storm that finally destroyed the pier once again. Not Enough Cash in Ventura? Living in Ventura is pretty great, so long as there’s enough cash to go around. But if you’re suffering from a lack of cash, then life can be extremely stressful. Where will you get money to pay the bills? How will you pay your rent on time? We all understand these issues. If you could use a little help in the form of a loan, we would love to help. If you live in Ventura and own a private car, go to the bottom of this web page, locate the online application and send it in to 5 Star Car Title Loans in Ventura. You might be pleasantly surprised! Our car title loans begin at $2,600 but can go higher if your car is more valuable. We’ll get an up to date evaluation of your vehicle, taking into account its age, odometer reading, type of car and condition. If the value is adequate to use as security for a fast cash loan, we’ll also determine that you fit our credit standards and that you’ll be able to make the monthly payments. Then we’ll contact you to set up a meeting in our offices at 5 Star Car Title Loans in Ventura so we can get more information. Don't Wait - Contact 5 Star Car Title Loans in Ventura! If you need money and you own a car, don’t wait to send in your application! You will still be able to keep your car if your request is approved, so why wait? Contact us now – 5 Star Car Title Loans in Ventura.